My obsession with fragrances only started very recently, I’d say.. It’s been perhaps only the past few years that I really started taking an interest in perfumes. Like I’ve mentioned several times before, I’ve never used to be a fan of perfumes and fragrances. These days though, it’s a different story, thanks to all the opportunities to explore so many different scents! 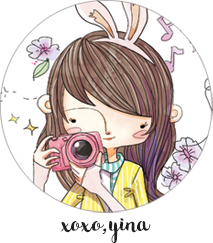 I’ve come to find out what I really like, and when I got older and got enticed into the glamorous grown-up world of beauty and cosmetics, fragrances became something I’ve learned to appreciate more and more. Now, spritzing my favourite scent has become a ritual that completes my beauty routine! Your chosen fragrance/scent says so much about yourself, and even though it’s something that can’t be seen or touched, the scent that you use is something that will resonate with others as part of your identity and personality. That’s how impactful a fragrance can be! Since I started using perfumes, I’ve been voraciously collecting the most beautiful fragrances, and I’m really proud to share that a huge part of my fragrance collection comes from SaSa, which I’m sure all you beauty insiders are well-acquainted with! Marc Jacobs, Prada (this fragrance is no longer available at SaSa), Valentino and Trussardi, just a few of the authentic brands I own and that SaSa carries. As if you needed any introduction, SaSa is one of the leading cosmetics retailing groups in Asia and is known as the one-step cosmetic specialty store, providing customers with the widest range of high quality products at the most competitive value. There are more than 600 brands available at SaSa! SaSa is also an authentic fragrance retailer carrying a wide spectrum of popular brands such as Anna Sui, DKNY, Boss, Kenzo, Gucci, Prada as well as exclusive brands such as Blumarine, Marina De Bourbon, Dsquared² and TOUS. Walking into a SaSa store is a dream for any fragrance-lover. If you’ve been wanting to get the latest popular fragrances, here’s your chance to get them at an amazing discount of 20% off (with additional 5% off for SaSa VIPs and Citibank cardholders!).. 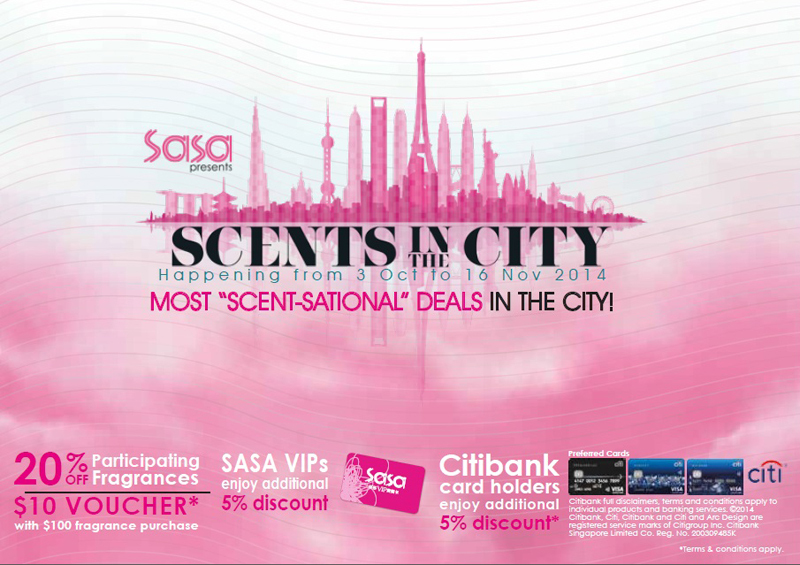 at SaSa’s fragrance fair: SCENTS IN THE CITY from 3 Oct to 16 Nov 2014, which is gonna be so scent-sational (sensational. scent-sational.. get it?? lol)!! 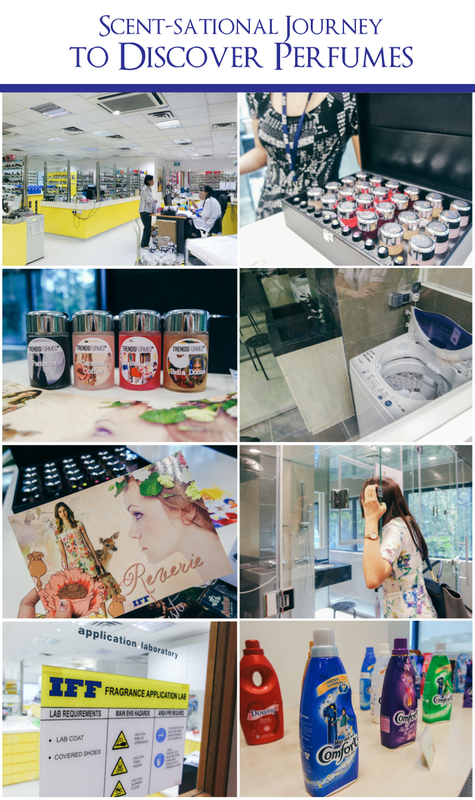 In conjunction with Scents In The City, I was invited to a special guided perfume laboratories tour and fragrance workshop at International Flavors & Fragrances (IFF)! Woke up real early and was all excited for the workshop! During our guided tour and workshop, I learnt SO much about fragrances and perfumes! 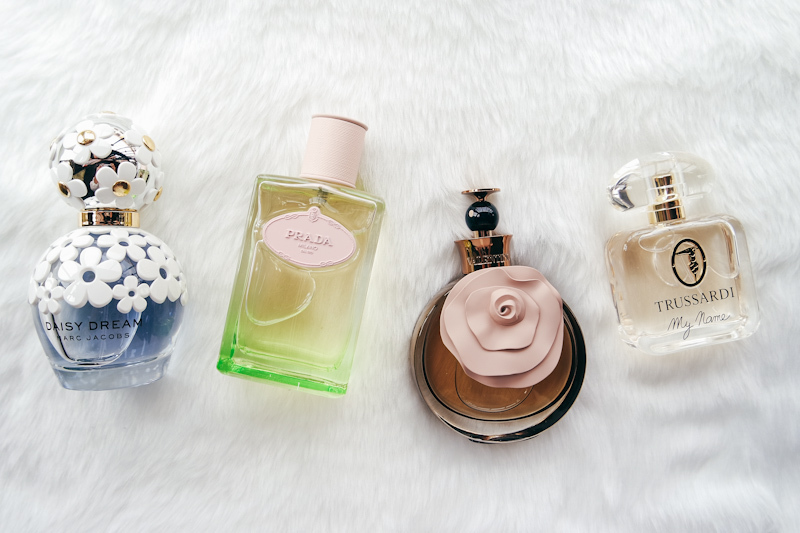 If you think that fragrances are just sitting in pretty perfume bottles, you are so wrong. Did you know that the average person comes into contact with least 17-21 scented products a day? Ranging from your toothpaste, to your shower gel, shampoo, and even household items like fabric softeners and detergent! 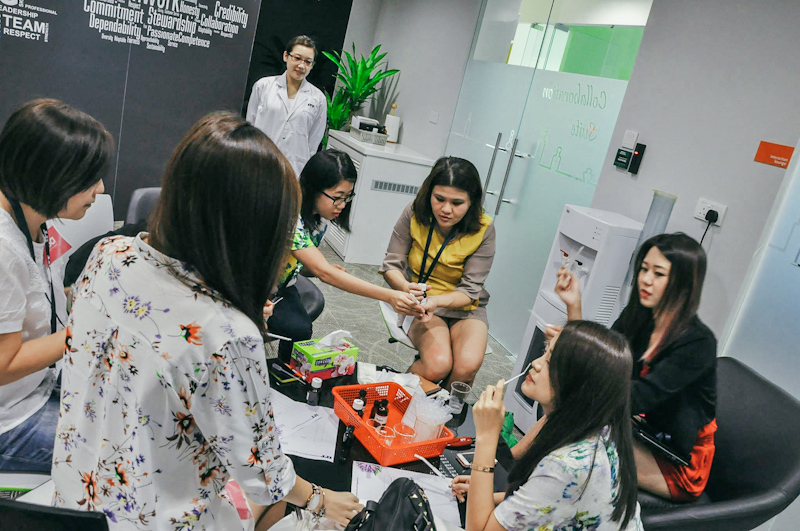 At IFF, we got to see how scents and fragrances are created, tested and measured in the labs, and also learnt about how different consumer markets have very varied needs and preferences when it comes to scented products, depending on lifestyle or even culture and tradition. It was such an eye-opener! We even had fun creating our very own fragrance too! Here’s our make-shift fragrance making laboratory.. Haha! Chemists for the day! We all took turns sniffing and deciding what we needed to add into our fragrance to balance out the different notes and make it as nice-smelling as possible. And we brought home our own creation at the end of the workshop! Back to SaSa’s SCENTS IN THE CITY! It’s happening from 3 Oct to 16 Nov 2014, and trust me when I say that you’ll get the best deals in town at SCENTS IN THE CITY! All shoppers will enjoy 20% off 23 participating fragrances, and 10% off all other fragrances in stores. Of course, the fragrances are all 100% authentic! Here’s a sneak peek of a few of the brands that are available at SCENTS AT THE CITY: Expect top fragrance brands such as Anna Sui, Calvin Klein, DKNY, Issey Miyake, Kenzo, Marc Jacobs, Prada, Valentino and many many more! There are also male fragrances available too! If you’re free on 11/12 October and 25/26th October, come on down and join some of the awesomest bloggers in Singapore at SCENTS IN THE CITY roadshow events too! Qiuqiu, Melissa Celestine Koh and Yutaki will be around to share their favourite scents and play games with you shoppers for you to win vouchers, beauty products or fragrances! 😀 Look out for them at: 11-12 October at Jurong Point SaSa Store (#01-16 JP1) and 25-26 October at Wisma Atria SaSa Store (#B1-06 to 08)!! Alright, go check out more details at http://www.facebook.com/SGSaSa!